It’s not easy being “green.” There are more regulations to adhere to. There are more hoops to jump through in your marketing. And standing out on the shelf can be more difficult. That’s why having eye-catching, attractive, environmentally-friendly, packaging matters. Manufacturers of green products have a unique competitive selling point – using their product means treating the environment a little bit better. Although this is a trendy and important competitive advantage, it’s not always easy to convey on the product labels in a quick, attention-grabbing manner. Here are a few ways you can design your labels to stand out on the shelves while still staying true to your eco-friendly roots. It’s easy to forget how your customers see your product labels on the shelf while trying to cram on all of the information you need to convey. This is especially true when you’re talking about the eco-friendly nature of your products, or adding on United States Food & Drug Administration (FDA) requirements, such as the nutrition facts label. Taking a step back to view your container through your customer’s lens will help in designing your labels. Where will your product be placed on the shelf? If it’s lower, the top of your product and label is more important than the bottom. What will the customer most likely see first? What is the primary display panel? What story are the side panels (which are often visible on the shelf) telling? During the creative process, start at the front with your eye-catching design, incorporate information and your company’s story on the side panels, and then end on the back with the required details. It’s common for environmentally friendly packaging to include muted colors, such as browns, tans, golds, and greens. Although these send an instant signal about the packaging and product, they tend to blend into the shelf instead of standing out. To send a signal that your product is eco-friendly, while still getting noticed from several feet away (where your customers will be scanning the shelf looking for your product), add secondary colors. For example, if you’re using tans and browns in your logo, adding small areas or images with red can make your product pop. This can be done without losing the inherent psychological values of your product being environmentally friendly. One way to infuse a more diverse color palette without stealing from the message of your “green” product is to use more pictures or icons on your labels. If your containers have any of these elements, include it on your label. Don’t assume a consumer knows. Many containers might seem recyclable but are not. Tell your consumer how she can continue to be friendly towards Mother Earth by indicating what she should do with it when she’s done using your product. Question: What’s your single biggest challenge when selling environmentally friendly products? 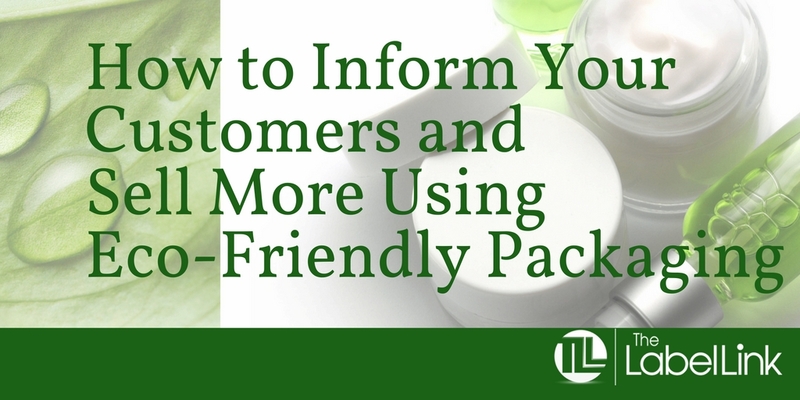 Green products are, in some ways, harder to sell because you have more information to convey. You also want to stay true to your brand’s message, which can often times make it harder to stand out on the shelf. We’ve worked with many manufacturers to overcome these common challenges. Can we help you too? Reach out and let us know about the biggest challenge you’re facing in your label design for your green product and we’ll put our heads together to find you the best solution.